Toyota has been dealing with negative backlash from the massive safety recalls of its vehicles; and is even suffering in terms of sales. So what does the company do to repair its image? Turn to Twitter, of course! 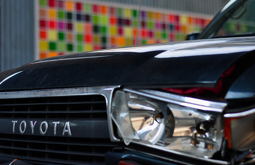 The Japanese auto giant has launched a branded channel on TweetMeme, in partnership with Federated Media, which aggregates and organize Twitter conversations regarding Toyota. 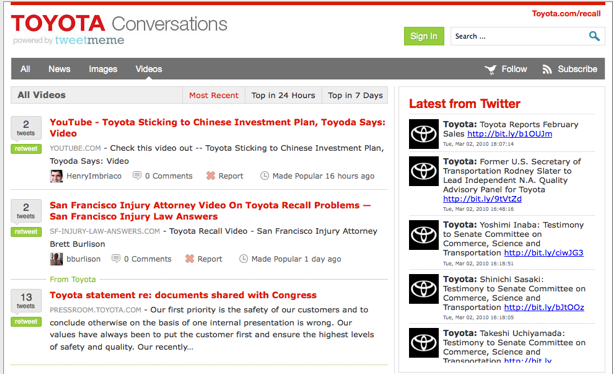 Called Toyota Conversations, the site brings together the top stories being Tweeted about Toyota, from news articles to press releases. The site also shows visitors the most popular videos and images being shared about Toyota on Twitter. And the channel includes a Featured Tweets from Toyota’s Twitter account and press room as well as AdTweets, which are Tweetmeme’s retweetable ads for Toyota. You may notice after taking a look at all of the top stories that are being aggregated on the site, that most of the news is positive. That doesn’t seem to match the general tone of the media writing about Toyota, which has been quick to criticize the car company for its manufacturing mistakes. If you take a look at Twitter sentiment app Tweetfeel, the sentiment of Tweets mentioning Toyota lean more negative. Tweetmeme channels can be set up to pick up only certain news sources. It looks like Toyota picked the friendlier ones. That being said, it’s definitely interesting to see such a high-profile company taking to Twitter to try to reform its image by engaging directly in a dialogue with consumers. As we’ve seen with the recent Southwest/Kevin Smith incident, Twitter is influencing public relations in unprecedented ways. Now more than ever, brands are flocking to Twitter to not only monitor and track what’s being said about their company on Twitter but to influence and participate in the conversation.